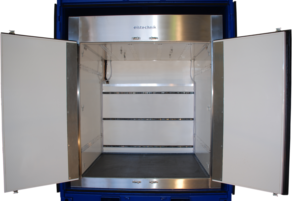 WHY BUY AN EISTECHNIK EUTECTIC REFRIGERATION SYSTEM? A eutectic refrigeration system produces no CO2 emissions or noise pollution while in use. To prove this, every set is supplied with its own Environmental Certificate. Breakdowns are so rare they’re almost newsworthy. Moreover, if it ever does breakdown, it can only do so at the depot, meaning vehicles will never be stranded with product defrosting again. Running and maintenance costs of an eistechnik system can be as much as two thirds less than air blown units. Click here to read more. Eistechnik re-engineered every aspect of eutectic refrigeration, and the result is a system that is up to 49% more powerful than anything before (click here for proof), yet charges down in as little as half the time. Welcome to eistechnik, a completely new generation of eutectic transport refrigeration technology. Eistechnik is the world leader in eutectic refrigeration, providing high quality, reliable, and powerful refrigeration systems that are leading the way in ‘green’ refrigeration systems in several of the world’s transport sectors. Traditional air blown refrigeration units are extremely pollutant, noisy, and unreliable - eistechnik systems create no emissions or noise pollution while in use, rarely (if ever) break down, and are significantly more powerful than anything comparable. Probably their biggest strength, however, is the overall lifetime costs - they can be as much as two thirds less than air blown systems! If you have never used a eutectic system before, or are just curious as to how they work, then click here to find out. The simple truth, however, is that they are easy to use, require minimal changes to operations that haven’t used them, and are suited to nearly all types of transport in one form or another. Eistechnik is rapidly becoming the choice in environmentally friendly refrigeration systems for the 21st Century. If you can’t find what you want on this website, or would just like to get in touch with us, then please don’t hesitate to contact us now.